The Rethinking The Future has announced the winners of this year’s Architecture, Construction & Design Awards. Winners from the thirty six different building categories not only demonstrate excellence in contemporary architectural design but also further design process in innovative ways and serve as an inspirational project for the young generation of architects. This year, RTF received about 442 Registrations from across the globe. 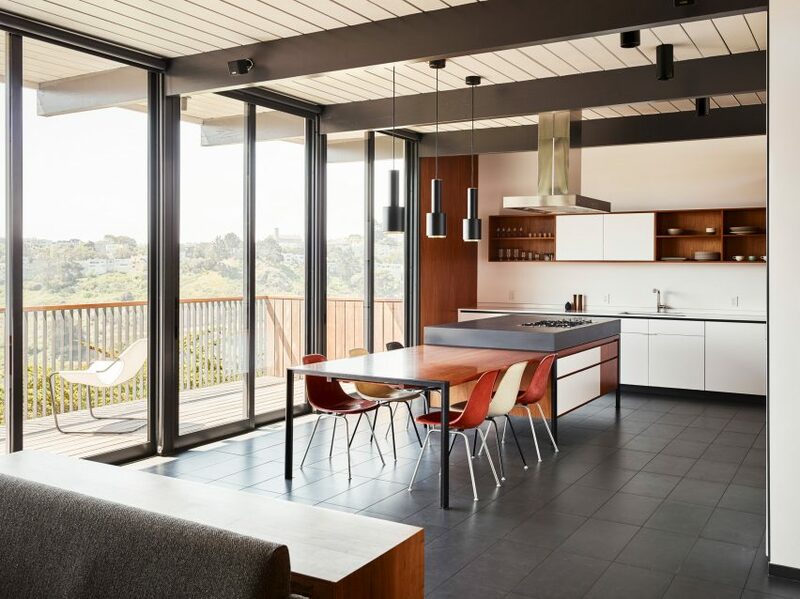 Architecture firm Michael Hennessey has refreshed a 1960s house in California built by Joseph Eichler, the father of America’s modernist housing subdivisions. The two-storey residence was built in San Francisco’s Diamond Heights neighbourhood in 1965. It is one of over 10,000 dwellings for the middle class that post-war real-estate developer Eichler completed between 1949 and 1966. 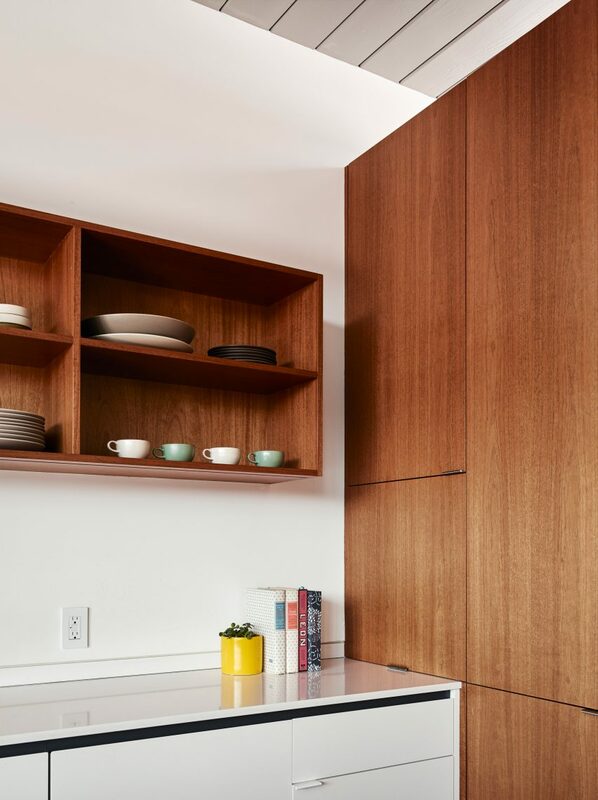 Commonly called Eichlers, the mid-century residences are recognised as examples of modernist architecture and feature post-and-beam structures, open-floor plans and glass walls. According to local practice Michael Hennessy Architecture, many have received renovations that disregard its original details. The studio’s Diamond Heights Renovation aims to remedy one of these “overly-aggressive” overhauls. “We decided to strike a balance between the positive, inherent qualities of an Eichler structure with modern improvements that enhance rather than compete with the existing building,” said the studio. Completed for a couple with two children, the renovation involved rearranging the interiors of the 2,210-square-foot (205-square-metre) property to create an open-plan living, kitchen and dining room on the first floor. In the family room, all of the later additions were stripped out to reveal the original structure, and tongue-and-groove ceiling boards. The post and beams are painted dark grey, while the wooden ceiling is a contrasting paler hue, which the studio says helps make the space feel higher. Plenty of daylight is brought in through a new set of sliding glass doors that open onto an outdoor deck. The frames of the windows are painted to match the colour of the structural elements. A stone-veneer fireplace added in the 1980s was stripped out and replaced with concrete blockwork. Flanking the fireplace are mahogany slip-matched, wood-veneer panels, which would have been found in typical Eichler homes. Shelving fills the back wall of the lounge, which is furnished with mid-century-style chairs, including a rocking seat, and a metal standing lamp that arcs from the corner. A mix of wooden and white cabinetry with concrete countertops is built in the kitchen. The dining table runs from the central wooden island, and is lit by three pendant lights hanging above. The table can be extended to accommodate more guests on chairs in hues of grey, blue and white. A study also occupies this floor, while the two children’s bedrooms and the master bedroom are placed on the ground floor. On this level, bathrooms are fitted with built-in mahogany and white cabinetry, as well as wooden shelving to match. Another Eichler home in California was recently revamped by Klopf Architecture, while other recent renovations of mid-century houses include the overhaul of a 1960s home in Seattle by MW Works, and the restoration of the Julius Shulman Home and Studio in the Hollywood Hills by Lorcan O’Herlihy Architects. Photography is by Joe Fletcher. The wood-lined interior of this high-end Japanese restaurant in London was designed by local practice Sybarite to evoke the feeling of a tranquil bamboo forest. Located on the city’s River Thames, close to Strand, the 450-square-metre restaurant is the second outpost of Yen – a 17-year-old soba restaurant in Paris owned by Japanese fashion company Onward Holdings. The design brief set by Onward Holdings, which also has Joseph and Jil Sander within its portfolio of brands, called for an interior that embraced Japanese materiality, design cues and construction techniques. “We wanted to create a space that triggered an emotional response such as reflection, pause, calm, rest,” Sybarite co-founder Simon Mitchell told Dezeen. The design centres around a timber “treescape” structure made up of varying thicknesses and tones of maple wood planks arranged around columns and across the ceiling to mimic a tree canopy. 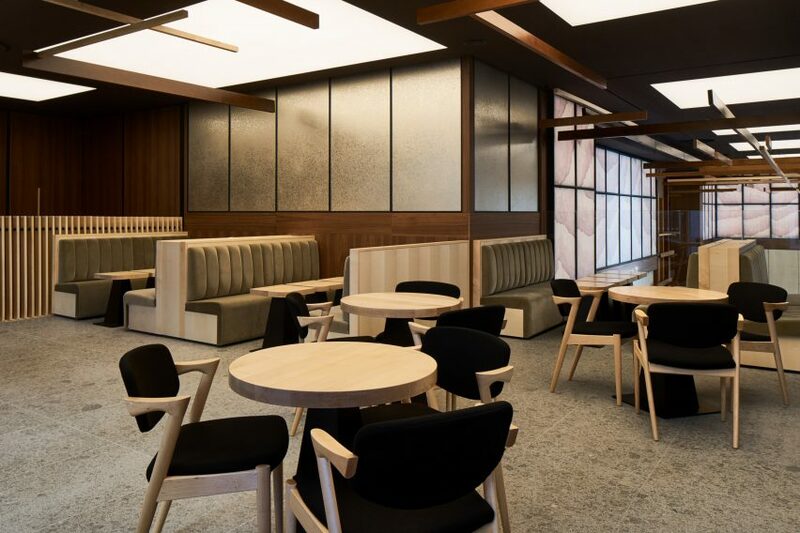 The restaurant’s subdued colour palette was inspired by bamboo and includes chocolate brown ceilings, soft green velvet upholstery and grey terrazzo flooring. Upon arrival, guests enter the bar on the restaurant’s mezzanine level. Here, banquette seating overlooks the restaurant, which is arranged across an L-shaped double-height space below. 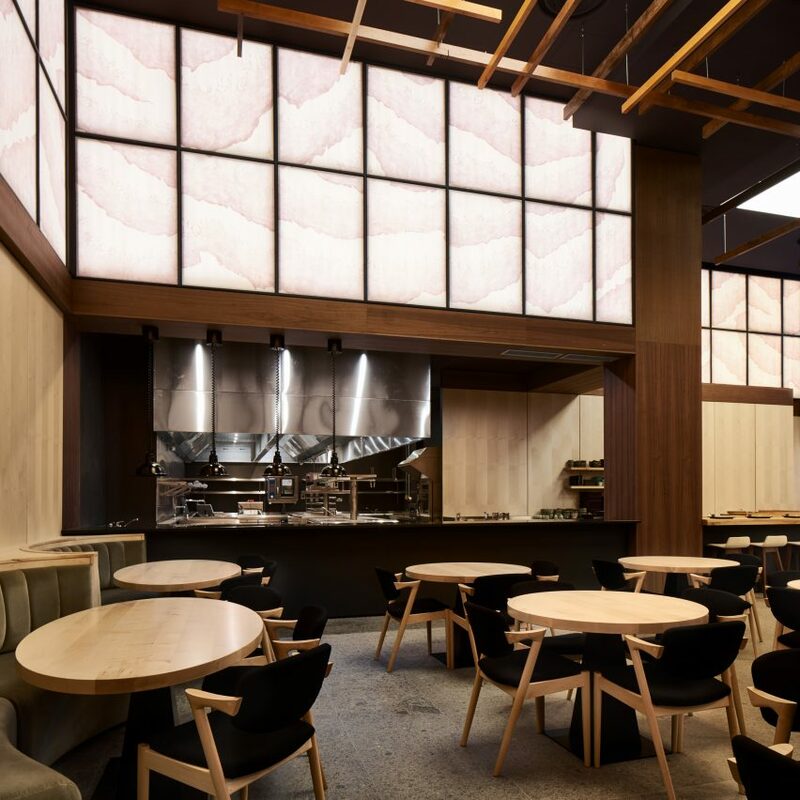 Also at the mezzanine level, perforated window screens made from maple are intended to provide privacy for customers, while still providing views into and out of the restaurant. A floating timber staircase connects the entrance and bar to the main dining floor below. Each timber section of the staircase, which is supported by a concealed steel structure, was carved from a single block of maple timber. The staircase leads diners past a glass-walled noodle-making station, where the restaurant’s soba specialists, Maruno Hidenori and Katsuki Sakurai, prepare buckwheat soba noodles twice daily. A sushi counter made from yellow cedar, which is traditionally used in Japan to build everything from housing structures to shoji screens, heads up the main restaurant space. Meanwhile, an 18-seat private dining space slotted below the mezzanine level at the back of the restaurant features a Japanese-inspired goutenjou ceiling made from paper and backlit by ambient lighting. Also in the private dining space, a floor made from Bolon’s woven vinyl flooring with black runner trims is designed as a modern and hardwearing take on traditional Japanese tatami matting. Metallic hand-painted wallpaper with a leafy texture is used in both the private room and mezzanine spaces. Sybarite was founded in 2002. The practice has since completed a number of retail and hospitality interiors, including a boutique in India with a modular system of hourglass-shaped shelves, and the Milanese outpost for fashion house Alberta Ferretti. Photography is by GG Archard. A wood-lined cafeteria, black and white stairwells and blue lounges all feature at the Montreal offices for video game company Electronic Arts. Local firm Sid Lee Architecture designed the interiors of the four floors occupied by Electronic Arts (EA) at 2200 Rue Stanley, in the Downtown area. The aim was to produce a creative working environment for employees at the global company, which is behind popular game franchises like FIFA and The Sims, and also owns developer Motive Studios. To do this, work areas were treated as clean, simple and adaptable, while communal leisure spaces were imbued with more character. In the open-plan offices, black frames are used to partition desk spaces and provide supports for ceiling lights. Mirrors are used to make the floor area look larger and help to bounce natural light around. Black is the dominant hue in the reception area, which is lined with glossy panels and giant screens. The same materials can be found in conference rooms, stairwells and bathrooms, where white surfaces are also used for a stark contrast. Next to the reception area, a space for coffee breaks and informal meetings sits under images of leafy trees affixed to the ceiling. Various breakout rooms each have their own theme, including one that is almost entirely painted blue, and another that looks like a sitting room. The cafeteria features timber panelling on its wall and ceiling and has long wheelable tables for employees to sit at using mismatched chairs. Other areas include a library, a gallery, a space for video game testing. “Among the key drivers of the project was the desire to attract and retain top talent in the gaming industry, and to build and foster a strong creative culture,” Sid Lee Architecture said. 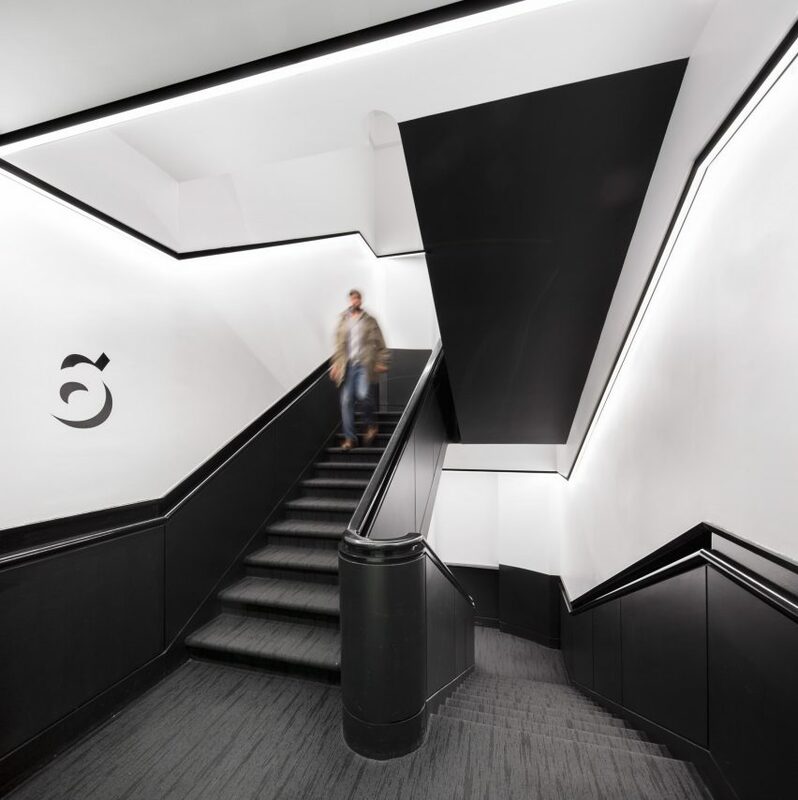 Founded in 2009, the firm recently completed the renovation of Montreal’s iconic Fairmont Queen Elizabeth Hotel and previously designed the Amsterdam headquarters for drinks brand Red Bull. 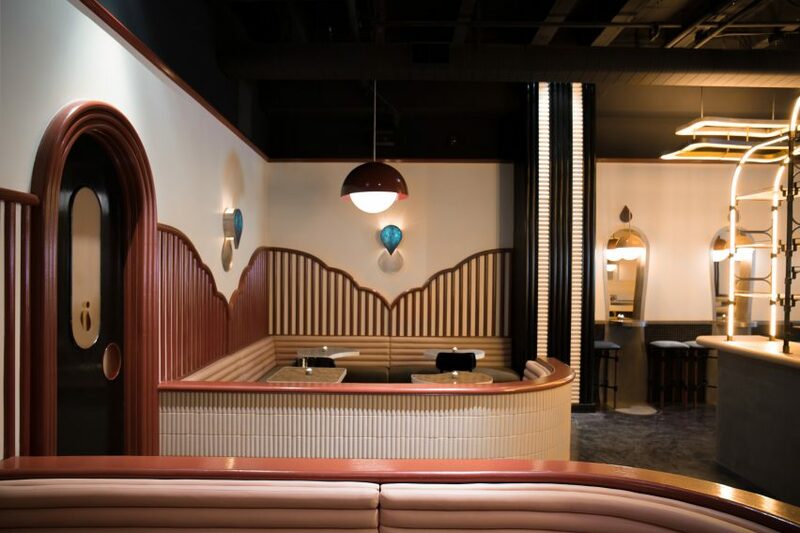 American design firm Home Studios has overhauled a bar in West Hollywood, using ribbed surfaces, soft colours and teardrop-shaped details to create an interior that looks part postmodern cafe and part Viennese speakeasy. Named Bibo Ergo Sum, which translates from Latin as “I drink, therefore I am”, the bar is the first to open in West Hollywood’s recently revamped Robertson Plaza. The area was formerly a bustling spot for shopping and dining, but was eclipsed by nearby Melrose. Entrepreneur Tait Forman decided to open a drinking spot where locals could sip cocktails from an ever-changing menu in a relaxed but quirky setting. For the interior, Home Studios used a wide-ranging variety of references. The architecture of 1900s Vienna, graphics from vintage French film posters, the work of Finnish designer Alvar Aalto and the aesthetic of 1967 movie The Graduate were all cited by the firm as influences. “We want guests to feel transported into a setting that feels both of the future and familiar at the same time,” said Home Studios founder Oliver Haslegrave. The horseshoe-shaped bar is situated in the middle of the room, circled by high stools. At the back, a shelving system for displaying liquor bottles has a curving shape reminiscent of art deco motifs, and its outline is illuminated. In all four corners, booth seating is formed by semi-enclosed areas. These are lined with ribbed cushioning coloured light pink, forming backrests for the built-in seating. In between, high wall-mounted tables for two each have their own mirrored backdrop and domed pendant lamp above. Dado railings are used to wrap the room at two heights and frame the arched door to the bathrooms at the back. Raised vertical stripes in the same hue pattern the sandy-coloured walls above the booths at the back. 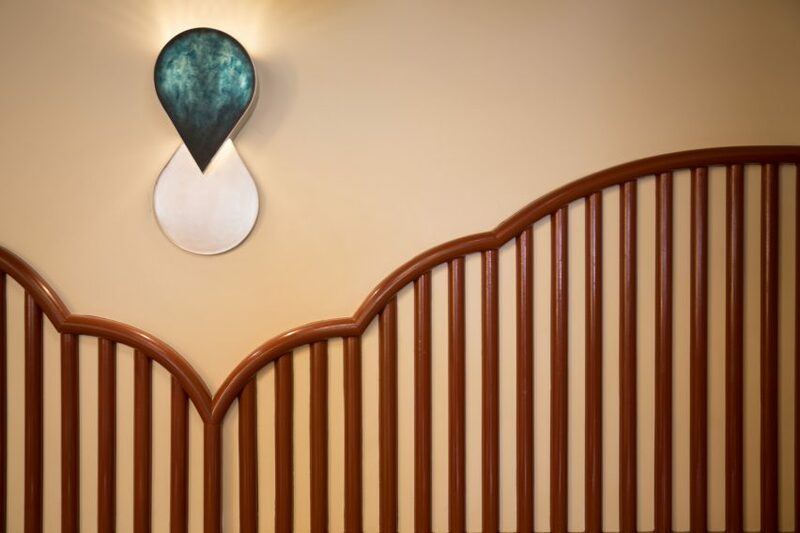 Other details include teardrop-shaped sconces with pearlescent green fronts and translucent glass partitions held between stripy marble cylinders on both sides of the entryway. All of the furnishings and fixtures are custom designed and made for the space. “The result is a dynamic blend of surreal details, unexpected materials and dramatic proportions that deliver a completely unique aesthetic,” said a statement from the bar, which opened 17 November 2017. The strict symmetry at Bibo Ergo Sum is reminiscent of the cinematic style of film director Wes Anderson, who has seemingly influenced many interior designers of late – and who also created his own bar at the OMA-designed Fondazione Prada in Milan. These new renderings reveal more details of the plant-covered residential complex that Chinese architecture studio MAD is building in Beverly Hills. Designed like a hilltop village, the Gardenhouse development at 8600 Wilshire Boulevard is under construction in the affluent California city. The new images show typical interiors for the 18 white gable-fronted dwellings, which sit atop a podium of foliage-clad shops. To complement the architecture by MAD, the Beijing-based firm led by Ma Yansong, US office Rottet Studio has used a minimal palette of mainly white surfaces, light wooden floors and marble accents for the interiors. 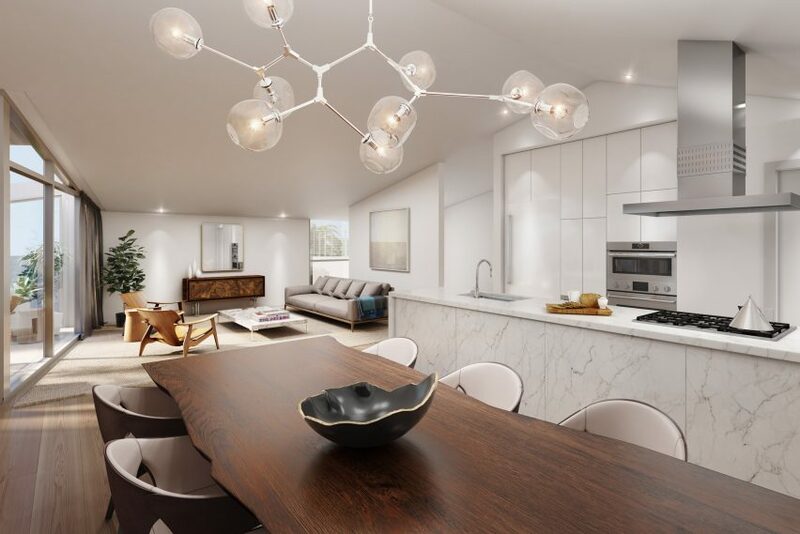 “The spaces will pay homage to the incredible building design while evoking the spirt of California living and residential modernism,” said a statement written on behalf of project developer Palisades. The faceted roofs of the buildings will be expressed inside, either in double-height living spaces or bedrooms. The cluster of dwellings will be arranged around an elevated central courtyard, where decking will be interspersed with planting. Residences will have balconies facing onto this area, peppered with trees and other greenery. Some homes will also include private terraces hidden from view. 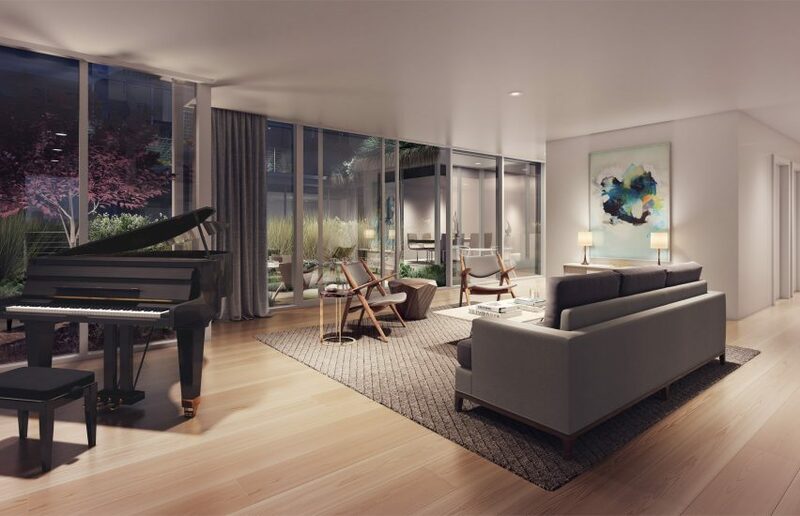 The mixture of villa-style townhouses, villas, studios and condominiums are assembled into volumes that will rise in height towards Wilshire Boulevard. Below, native drought-tolerant succulents and creepers will cover the street facades, followed by glazed shopfronts at the base. The Gardenhouse scheme was first unveiled in June 2015, and provides an example of MAD’s preoccupation with fusing architecture and nature. The firm is renowned for translating Chinese shan-shui art, which depicts dramatic landscapes of mountains and water, into building forms. Recently completed versions include Huangshan Mountain Village and Chaoyang Park Plaza – both in MAD’s native country.